The Wizard of the Emerald City (Russian: Волшебник Изумрудного Города) is a 1939 children's novel by Russian writer Alexander Melentyevich Volkov. The book is a re-narration of L. Frank Baum's The Wonderful Wizard of Oz. Baum's name is sometimes credited in the book (in the appendix by Volkov, which is found in some editions, where Volkov describes the origins of his book). The names of most characters are changed, some elements of Baum's novel are removed, and some new elements are added. The book was illustrated by Leonid Vladimirski in 1959 and became quite popular in the 1960s, leading to five sequels: Urfin Jus and his Wooden Soldiers (1963), The Seven Underground Kings (1964), The Fiery God of the Marrans (1968), The Yellow Fog (1970), and The Secret of the Abandoned Castle (1975, published in 1982). These sequels were written by Volkov himself and are not based on Baum's plot elements, although we do encounter the powder of life, a character called Charlie Black who is not unlike Cap'n Bill, intelligent foxes, and the use of a Sandboat similar to Johnny Dooit's, albeit with wheels. Volkov's Magic Land series, as it was called, was translated into many languages and was popular with children all over the Eastern Bloc. Volkov's version of Oz seems to be better known than Baum's in some countries, for example in China and the former East Germany. The books in the series have been translated into English — or retranslated, in the case of the first book — by Peter L. Blystone, and were published by Red Branch Press in three volumes (two books per volume) in 1991 (revised edition 2010), 1993, and 2007. A very important reason for the success of these books were the illustrations by Leonid Vladimirski. 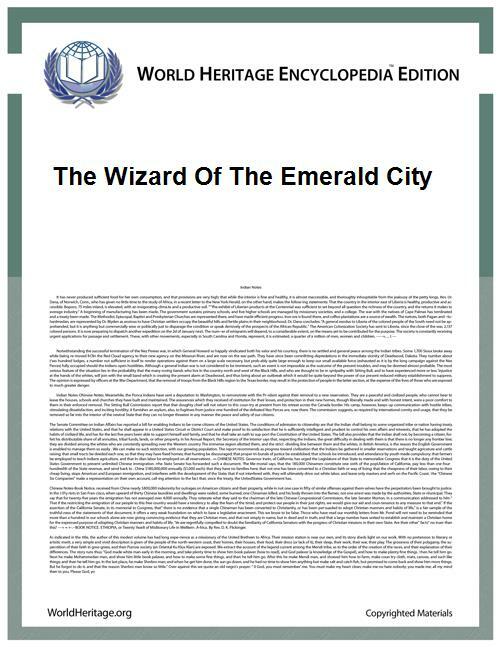 Notable differences between "The Wizard of the Emerald City" and the original book "The Wonderful Wizard of Oz"
In the original book, Winkies' favorite color is yellow. In Volkov's version, it's purple. In the original book, the characters at one point have to run away from beasts called Kalidahs. In Volkov's version, Kalidahs are replaced with saber-toothed tigers. The Fighting Trees and the China Country are omitted in Volkov's version. Instead, the main characters secondly have to cross river in other place by making another raft, and things go awry when a storm begins. In Volkov's version, just before meeting the Cowardly Lion, Ellie gets kidnapped by an ogre, and Scarecrow and the Woodman save her. In Volkov's version, Munchkins, Winkies and Quadlings (renamed as Chatters, Russian: Болтуны) have different tics involving their people's names: Munchkins constantly move their jaws as if they were munching, Winkies blink a lot and Chatters can't stop talking. The armless Hammer-Heads with stretching necks were replaced in Volkov's version with an anatomically correct and physically strong nation of Leapers. In Volkov's version, as soon as Ellie and Toto arrive in Magic Land, Toto gains the ability to speak, which he retains until they leave. In Baum's version, this is not the case, and Toto behaves exactly like a normal dog. In Baum's version, Dorothy is an orphan and lives with her uncle Henry and her aunt Em. In Volkov's version, Ellie lives with both of her parents, John and Ann. In the original version, the Good Witch of the North kisses Dorothy on her forehead, blessing her, and the Wicked Witch of the West doesn't dare hit her because of the blessing. In Volkov's version, Villina doesn't kiss Ellie, and Bastinda is afraid of hitting Ellie because she wears the silver shoes. In the original version, Dorothy was unaware of the Wicked Witch of the West's aquaphobia until the latter melted. In Volkov's version, Ellie knew Bastinda was afraid of water, and often left the kitchen floor wet to annoy the witch. An additional subplot in Volkov's version during Ellie's imprisonment in Bastinda's castle involves Ellie and the cook Fregoza motivating other Winkies to prepare a coup against Bastinda. The prologue in Baum's book tells the story solely from Dorothy's point of view. The prologue in Volkov's book tells the story first from Ellie's prospective, then switches to Gingema then back to Ellie who is running away from the cyclone. In both books, Kansas is presented as a gray, dull place as opposed to the Land of Oz. The English edition (translation) together with the first sequel is Tales of Magic Land 1.